Have lots of sweaters, the shelf dividers keeps in place on the closet shelf. No sliding, no falling. A good product to organize your shelving! I used it to make my sweaters from falling all over the shelf so they are stacked neatly! Putting things in their place! They fit my shelves nicely. They allows me to stack shirts and sweaters in neat and tidy piles. Outstanding for upper shelf in closet. No installation! It does what it says it does! I use this product for closet organizers. Very useful. I USED THIS PRODUCT IN MY LINEN CLOSET. IT DOES WHAT IT SUPPOSE TO DO. I would diffently buy the shelf dividers again. I have been looking for a shelf divider for awhile. When I saw these in the MILES KIMBALL catalog I jumped to place an order. I didn't want to miss out. I received the 4 shelf dividers and used them to keep the linen closet neat. I found them to be VERY STURDY and just what was needed to keep the linens from falling over. I reordered another set and will probably get 2 more. Great storage for top of clothes closet. The shelf dividers are perfect!! It was just what I needed. Used them to organize my linen closet in the bathroom. Installed in a snap with no effort!! Will use the extras to organize my pantry!! We have used several sets in our linen closets. As renters, this product solved storage solutions. Especially keeps sheets and blankets and towels from falling into each other. I need to utilize all the space I have and it was wonderful. This is exactly what I needed. It worked so well I ordered some for my other closet. These are quite handy and easy to use for closet shelf organization. They did EXACTLY as your picture shows! They were precisely what I needed to re-organize my randomly piled: collared shirts; non-collared shirts; pocketed T's; non-pocketed T's, walking shorts, fleece tops, fleece bottoms, etc. I ordered two sets; and if I had had more shelf space, I would have ordered more. The dividers are well made and fit perfectly on our closet shelves. It really helped organize our main clothes closet. as a divider in the closet, these are perfect, which is why i am ordering another set today. thanks alot. Using these on the top of my closet to organize vests, sweaters, etc. These were taller than some others I saw online. Keeps all the stacks upright and makes it easy to find something. Bought these dividers to bring some order to clothes and handbags that were piled on the wooden shelf. 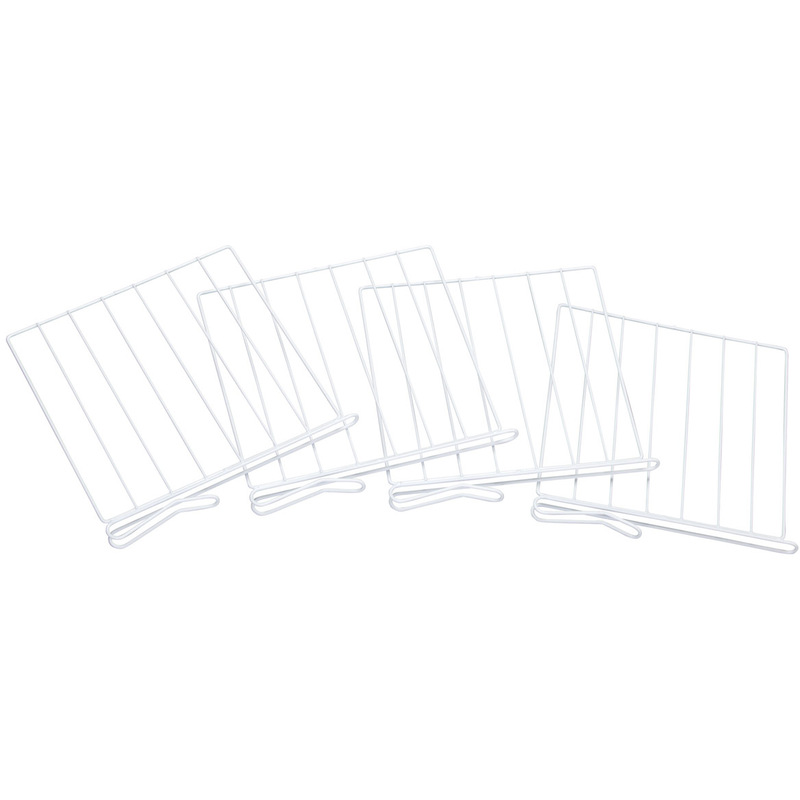 These dividers were completely adjustable and high enough to accompany sweatshirts and fleece shirts without spilling over. Best of all, they did not have to be nailed to the shelf. I have nothing bad to say about them. These dividers have been out for years but I've never used them until now. I wonder why I waited so long! They keep things from falling over when I take one thing out of the stack. They fit the shelf snugly and are sturdy enough to do the job. great use in Bookcase, office areas, closet, kitchen shelves, anywhere possible even garage area. These shelf dividers will keep our closet shelves from becoming the jumbled mess they seem to "fall" into with everyday use. Helped to put away things on closet shelves after downsizing and moving. Divide items on closet shelves...t-shirts from sweat shirts etc. These shelves really make organizing your closets a snap. Things no longer fall over. You can place them as close or as far apart as you want. I liked the ones I ordered so much, I ordered a set for a friend as a house warming present - they really do work to keep the piles of clothes on closet shelves separated and neat. this is a very good solution to end linen closet clutter. they are easy to install and they look good. however, some shelves are a little too low so measure carefully. Things that are great about it. It lets me organize my purses in such as way that they are now easy to find the one I am looking for. Used with sweaters and light weight items. Thank you, this worked out perfectly! thank you, this worked out exactly as I hoped it would! Of the four, the first two went into place on my wire shelf easily. The last two were a challenge, but I finally made them work. I'm glad the first two worked well or I would have given up. I am handicapped and can hardly stand, but I was so excited when I got these that I installed them myself. So, that says a lot for them. I love them!! The shelve dividers do separate my sweaters & sweatshirts on the closet shelf but they lean to the left. If I had something less dense between the shelves I don't think they would work. I would recommend them with the caution about their being flimsy. They might still fill their need as they did mine. Served as a good separator for towels and sheets but flimsy. Did not keep a firm separation. Leaned left and right. Needs a tighter hold to the shelf. Maybe an adjuster for shelf or a vise to hold it tighter. Needs shelf that is 12" deep or more to stand up straight. These dividers are handy to keep clothes separated. I need to keep certain items on my out-of-reach shelves separated and corralled. My linens a mess in my top shelf closet. Can't wait to get some order there. Own similar item and needed more. They have served me well in the past. I needed these to keep closet organized. They will come in handy. Reasonable price and seemed to be just what I needed to organize my purses on a closet shelf. Looks like easy way to organize items I don't want to put on hangers. It looks like just the thing to organize sweaters and sweatshirts of three young girls and their very busy Mom. I hope this will be the best, and final, solution! These keep my closet shelves so organized and neat! To separate clothes. Unfortunately, they are too tall for my closet shelves. I've been looking for this kind of divider to help organize my purses on my closet shelf. Hard to find this kind of useful storage item. Downsized my home and needed to organize long closet shelf to hold my purses. Local home stores did not carry this product. To keep my sweaters neatly stacked. Just moved to much smaller home and desperate to put everything away. Will help organize closet shelves. I needed it to organize purses in my custom closet. I need to make better use of small space and for convenience. 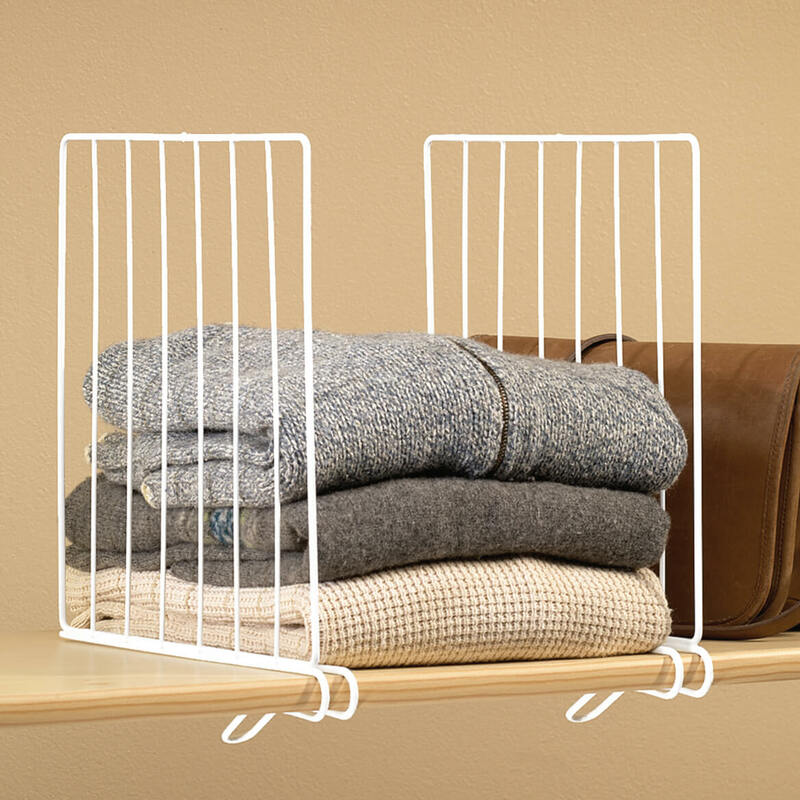 hope that my closet will be more organize by using this dividers to fold and stack my sweaters etc , etc ! I'm hoping this will help keep each pile from falling into each other. Best value for good quality per reviews of others who have purchased. These dividers will help my organizing efforts at home over the holidays. To keep sweaters from sliding over and falling. I need dividers that are max. 11" high and for wood shelf the shelf is 1 1/2" thick. Do you have anything that size? BEST ANSWER: Thank you for your question. Unfortunately, we do not have anything like that. We hope this information will be of help to you.